BostonTalks is throwing the formal panel discussion out the window. Each event combines short speaking programs, drinks, and a chance for you to join the conversation. 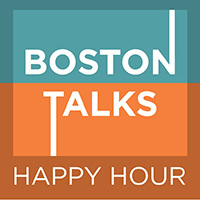 Be part of the #BostonTalks happy hour by tweeting with us! Join WGBH’s conversation plus wine and local craft brews for $5 a glass. Hear from and connect with local experts in a variety of fields while enjoying the great company of your neighbors from Boston and beyond. Get tickets to upcoming BostonTalks on the WGBH Events page!